My folks live in Hampton, VA and I see them pretty regularly. I took my mom to the Mid-Atlantic Quilt Festival last year (we go almost every year, actually) and we came across a booth run by Bella Fabrics. Neither of us knew they were located only 20-25 minutes from Mom's house and the ladies at the booth were so pleasant, we knew we'd be stopping in to their store soon. This is their store located at 13478 Carrollton Blvd., Eagle Harbor Shopping Center, Carrollton, VA 23314. Good space for sit and sew. 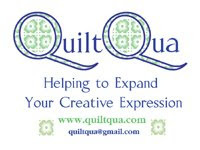 Lovely fabrics, displayed sample quilts, etc. This is my fabric haul this past weekend (sorry, don't know why it's sideways). Best of all, helpful and friendly staff! These ladies were so funny and enjoyable I found myself wishing I lived close enough to attend the Friday night Sew-Ins I see listed at the Bella Fabrics website. We gabbed about current If you are in the Hampton/Carrollton, VA area, go to this store. Check them out. I am fairly certain you will be returning again and again. One additional note, take a look at their link for Expo II- 2012. A weekend of several classes and it looks wonderful! i'm so glad you posted pictures of your visit!! there is a pattern for something that ive been looking for, and one of the pictures you posted had it in it!! called the shop and i have my very own pattern on the way!! Cute fabric haul. And that shop looks huge!